eNewsletter: Farewell to Pan Am, Roselle has ICE CREAM & more! PAN AM PUP: The Distillery District’s resident canine superstar Dagny poses with the Brazillian national team, in town for the Pan Am Games. Photo by Sue Janzen. A PAN AM ENDING: Time flies, doesn’t it? With the eruption of CN Tower fireworks and the thud of a Kanye West mic drop, the Toronto 2015 Pan Am Games came to an end yesterday, even though it kind of feels like they just started. Thanks to the 23,000 (!) volunteers who worked so hard over the last few weeks to keep things running smoothly. And to the organizers of the cultural festivals — Panamania in the Distillery was great fun. And thanks of course to the athletes for being such great Corktown guests. 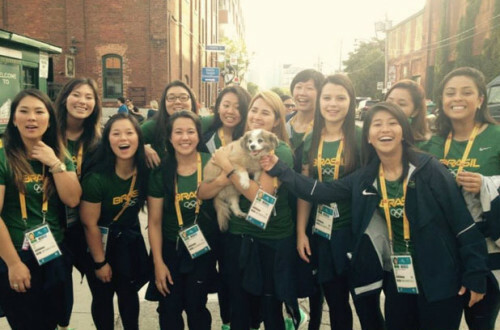 A special shout-out to Dagny, the now-famous Pan Am Pup who made it her mission to get a photo with every country represented at the Games. You can read about Dagny’s mission here, and check her instagram account for all the photos. For a good rundown of what’s changing now that the Games are over, check out this article in the Toronto Star. Of note: the HOV restrictions on highways change to only requiring two occupants starting Tuesday. Most other traffic restrictions will remain in place, as the ParaPan Am Games start on August 7 – just two weeks away! SCREAM FOR ICE CREAM: This week is set to be ridiculously hot, so why not cool down with soft serve ice cream at Roselle Desserts (362 King East)? After taking a month to develop their ice cream recipe — unlike a lot of places, they aren’t using a prepackaged mix — soft service is now available Thursday to Sunday, from 1 p.m. until they sell out. They’ve just introduced a Cream of Earl Grey flavour that features infused whole tea leaves as well as toasted milk notes. PAN AMERICAN FOOD FESTIVAL: For a different kind of Pan American experience, the Pan American Food Festival runs from Thursday, July 30 through to Monday, August 3 outside Daniels Spectrum in Regent Park. Sample food from 41 countries and enjoy great entertainment. All the details are online. Our friends across the river in Riverside are hosting their next RIVERSIDE WALKS event on August 8, complete with the unveiling of their new Sports Legacy mural. Check out the details here. Got a story about something going on in Corktown? Email website@corktown.ca.